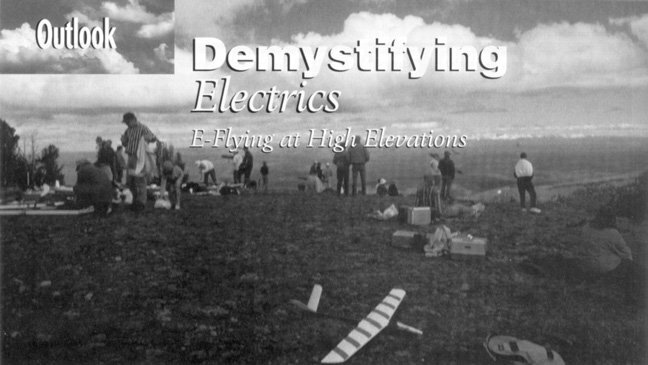 More than once, I’ve heard it said that electric airplanes aren’t suitable for flying at high elevations. Usually, this "fact" comes from a glow flyer at a highly elevated club who wishes to discourage a newcomer from flying electric, and uses the elevation as an excuse. However, as I’m about to show, this simply isn’t true. Performance of the power plant. Aerodynamics of the airframe (lift and drag). Lets look at each of these in turn. I’m going to resort to a bit of math. It’s really not very complicated, but you can ignore the equations if you’re not mathematically inclined. Flying high at Wallowa, Oregon. If you live on the beach in California or below sea level in the Netherlands, and are going on a vacation to the Rockies, Alps, or Himalayas, take your plane and some slightly larger propellers and go fly! An internal combustion (IC) engine (glow, gas, diesel, etc.) derives power from burning a fuel in the presence of oxygen from the air. The amount of power is proportional to the amount of fuel burned. For optimal performance, the air-to-fuel ratio is fixed. Too much air just means extra air that isn’t used and is taking up space that could be occupied by fuel. Too little air means some of the fuel won’t burn. It follows that the maximum power that can be produced by an IC engine depends on how much air is available. At high elevations, there is less air, and hence the engine will produce less power. E is the elevation in feet (for elevation in metres, change 145,442 to 44,331). This equation is valid from -1,000 to +36,000 ft (-300 to 11,000 m). The performance of an electric motor is not appreciably affected by elevation. There is less cooling air mass available, so it might run a tiny bit warmer, but there is also less armature drag, making it slightly more efficient. However, air is not needed; an electric motor will work perfectly well in a vacuum. L is the lift force, which in level flight equals the weight of the plane. CL is the coefficient of lift for the wing, V is the airspeed, and A is the wing area. 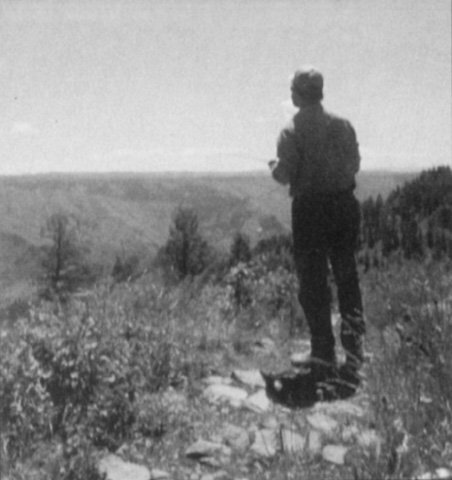 When we move to a higher elevation, the air density decreases as we saw earlier. Since the weight of the plane, the lift coefficient, and the wing area all stay the same, V must increase if ρ decreases. Specifically, V2 must be divided by ρ, and hence, V must be divided by the square root of ρ. For example, we saw that at 5,000 ft, ρ is only 0.8617. Therefore, V must be divided by 0.9283 (the square root of 0.8617), which is the same as multiplying by 1.077. In other words, airspeed must increase by 7.7% to achieve the same amount of lift. This increase in airspeed suggests that more power is needed, but fortunately this isn’t the case. Just as lift decreases with elevation (for a given airspeed), drag also decreases by the same factor, so no additional power is needed. The operation of a propeller can be simplified down to three numbers for the purposes of this discussion: shaft power, thrust, and pitch speed. One of the great rewards of flying at high altitudes is simply the shear beauty of the view from a mountain top. Wallowa, Oregon. D is the propeller’s diameter, P is its pitch, N is the rpm, and ρ is once again the a air density. Notice that I haven’t specified any units here, such as inches, Watts, etc. Since we will just be comparing relative numbers, the units don’t matter. Notice that the power required to turn a particular propeller at some rpm goes down as air density decreases (i.e. elevation increases). Again, I haven’t given any specific units. Like shaft power for a given propeller and rpm, thrust also decreases with air density. Notice that pitch speed does not depend on diameter or air density. So far, we’ve determined that at a higher elevation, the plane must fly faster, but that drag is reduced. This means we need a higher pitch speed but the same thrust. where P0 is the pitch used at sea level. If we divide this by the thrust at sea level (which is just D04 P02/3 N2), this hideous looking equation reduces to just ρ1/6. For our 5,000 ft example again, that means that the thrust will be 0.86171/6, or 0.9755 times the sea level thrust. This is close enough to be not worth worrying about (the propeller diameter would have to increase by only 0.6% to make up for this). Let’s take a look at an actual model and see what we would have to do to fly it at 5,000 ft, 10,000 ft, and 20,000 ft based on its characteristics at sea level. The model under consideration is a 48 oz, 420 sq.in sport plane normally pulled along by an 8×6 propeller turning at 9000 rpm. We’ll divide all our calculations by a fudge factor of 50 billion (5×1010) since that will give us numbers closely corresponding to the actual thrust in ounces. The thrust at sea level would then be 84 x 62/3 x 9,0002 / (5×1010) = 21.91. As we saw above, at 5,000 ft, the air density is 0.8617. The stall speed increases by a factor of 1.077 (the square root of 1/0.8617), so the propeller’s pitch should be increased by this amount to 6.46 inches. The diameter must be increased by the eighth root of 1/0.8617, or 1.019 times, giving 8.15 inches. Since one won’t find an 8.15×6.46 propeller, let’s try an 8×7. With an 8×7, the thrust is now 84 x 72/3 x 9,0002 / (5×1010) x 0.8617 = 20.92. This combination of thrust and pitch speed is close enough to the ideal to provide comparable performance. Now lets see what happens at 10,000 ft. Here, the air density is only 0.7385. The stall speed will increase by a factor of SQRT(1/0.7385), or 1.164. So the propeller’s pitch should be increased from 6 to 6.98. The diameter must be increased by (1/0.7385)1/8, or a factor of 1.039, giving 8.31 inches. An 8.5×7 prop would be suitable. The thrust becomes 8.54 x 72/3 x 9,0002 / (5×1010) x 0.7385 = 22.85. Neal Capener powers out his electrified Robbe ASH-26 near Obstruction Point in Olympic National Park, Washington, approximately 6,300 feet above sea level. Finally, let’s try 20,000 ft. Here the air density is down to 0.5328. Stall speed will be 1.37 times higher, so the pitch should be increased to 8.22 inches. The diameter must be increased by a factor of 1.08 to 8.66 inches. A 9×8 propeller would be a good try. The thrust would then be 20.72, which is very close to the sea level value. If you are hand launching such a model, be sure to throw it harder, because it has to fly 37% faster than it does at sea level. So even at 20,000 ft, the electric model will still perform well (the person launching it could benefit from some bottled oxygen however). A glow model on the other hand would be operating at 53% of full power, which is roughly equivalent to removing 27% of the cells in an electric model. Imagine flying your favorite 7 cell model on only 5 cells. For those of your who don’t own a scientific calculator, the following chart lists the factors by which you should multiply pitch and diameter to fly at various elevations. If you are using a geared system, you can also compensate for altitude by changing the gear ratio. Instead of multiplying the pitch by the computed factor, divide the gear ratio by this factor instead. You will also have to divide the diameter by the square root of the pitch multiplier before multiplying the diameter by the diameter multiplier. For example, a system using a 12×8 prop on a 3:1 gearbox at sea level can use a 11×8 prop on a 2.38:1 gearbox at 15,000 ft. The lower gear ratio will increase the pitch speed back to what it was at sea level. The additional load caused by running the same propeller with a lower gear ratio requires the slight reduction in diameter. You can also experiment with combinations of gearing and propeller changes. In the above example, the original 12×8 propeller would work well with an intermediate gear ratio such as 2.7:1 or so. This explanation has been simplified somewhat from reality, but the results are still close enough to be valid in most cases. Changing propeller sizes will of course affect the power produced by the motor, since you aren’t going to be able to get exactly the right size to compensate for altitude. If you are operating the motor in its efficient range, this won’t throw off the calculations enough to worry about. One other issue is the Reynolds number. This is a magical airfoil constant that is a product of airspeed, wing (or propeller blade) chord, and air density. The performance of an airfoil is generally a smooth function of all these factors, but there are some points where the performance can suddenly change dramatically, and all the calculations go out the window. Fortunately, we are generally increasing speeds while reducing density, so the Reynolds number will remain relatively constant. There you have it. 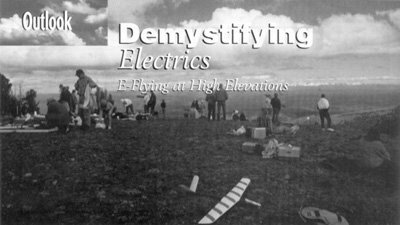 IC powered planes don’t have any advantage over electrics at high elevations. Au contraire! The fuel burners are at a distinct disadvantage. NASA is currently flying a remotely piloted electric aircraft at over 80,000 ft, where the air density ratio is only 0.033. A glow model would have only 3.3% of its power available at that altitude (actually, the engine wouldn’t likely run at all). An electric model can have all its power available. 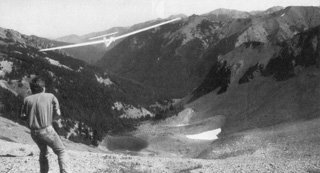 So if you live on the beach in California or below sea level in the Netherlands, and are going on a vacation to the Rockies, Alps, or Himalayas, take your plane and some slightly larger propellers and go fly! I live in Mexico City, at 7340 ft asl, and because ambient temperatures are relatively warm, IC engines lose about 25% power. A HOT 0.46 engine is required instead of a lame 0.40… Because air density and available lift is quite reduced, electric flight is difficult unless one builds very light airframes. A Turbo-Four car engine usually gives naturally aspirated V-8’s a bad, bad day! Very nice webpage indeed. Keep up the good work! (You must be a HP RPN Calc guy certainly!) Cheers.